Know your rights as a tenant or as an investment property owner in Calgary. If you are a landlord with rental property in Calgary, or if you are a renter in Alberta, it’s important to be aware of your obligations – morally and legally. I’ve compiled these tips from the Centre for Public Legal Education Alberta (CPLEA). This is a wonderful non-profit association dedicated to keeping people in Alberta up to date as to their rights. If a Calgary rental property is wrecked to the point that it is completely unlivable, or swept away and just gone, who decides whether the renter should be given their month’s rent back? It’s the tenant’s responsibility to ask. If there’s a dispute between the property owner and the renter as to the definition of uninhabitable, or if either party becomes unreasonable, legally the renter can go to court or to any provincial office that handles Residential Tenancy Dispute Resolution Services. If you need a third party to say, yup – this property can not be lived in – the renter can speak to a public health inspector by calling Health Link (811) or in Calgary they can connect with a by-law officer. If you are renting property, without a doubt you should have tenant’s insurance so that any of your own belongings can be replaced. The property itself would be covered by the rental property owner’s policy. It’s not up to the landlord to replace furniture or clothing lost due to flood or fire and it’s not up to the tenant to repairs windows, floor, appliances or anything that belongs to the structure. By law, the property owner must give the tenant 24-hours notice that he or she wants to inspect the damage. There must be communication from one party to the other, and certainly, within reason. 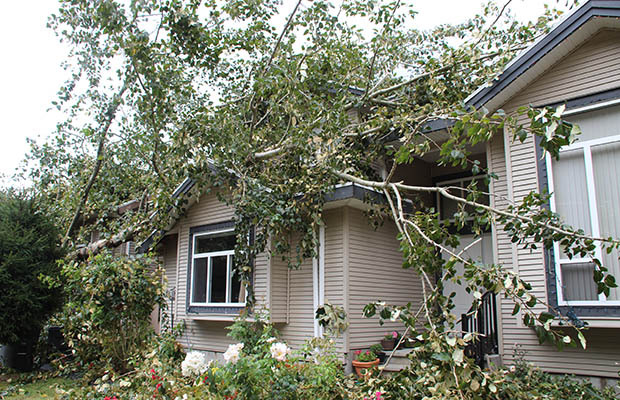 If damage has left the property with no windows or doors, legally the landlord must contact you. It depends on the relationship between the landlord and tenant prior to the event. If it has been testy, better stick to the letter of the law. No one wants to go to mediation over some technicality like this when there are bigger issues to address. The legal answer is that the tenant must continue to pay rent while the damage is being accessed, unless of course the property has been damaged in such a way that it’s beyond the control of either party. The term for this is “frustrated” where the legal agreement is impossible to keep. If a home is swept away in a flood it would be ridiculous to assume a now homeless tenant would be required to pay rent. However, legally, the renter would need to give written notice to the property owner that they no longer wish to be a tenant even if a fire was to rip through the property. If damage occurs to the home that is no fault of the renter or the landlord, like a fire, flood, mudslide etc, the property owner can not use the damage or security deposit to fix that damage. The money paid to the landlord can only used and/or kept it if the tenant directly caused damage or broke the lease any other way. Owning investment property in Calgary can be rewarding and profitable. Disasters are few and far between, and irresponsible tenants are possible, but the good ones far outweigh the bad. If you’re considering getting into the landlord business, please talk to us about which areas in Calgary are ripe for investment opportunities.